I’ve developed an exciting course through the Castleton Center for Schools entitled Redefining Teaching in a Chromebook Environment. Students will be pleased to receive a Chromebook as part of taking the course. But that’s not the exciting part. Lots of courses provide students with equipment, but what matters most how teachers use digital tools to improve teaching and learning. My 3-credit course explores ways that 21st Century, learner-centered strategies can be supported through the use of digital tools in the classroom. With an emphasis on transforming instructional practice, this course will support educators who are or plan to be implementing Chromebooks or Google Apps in their classroom. Chromebooks are much more than tools for email and Google Docs – take your teaching to the next level. P.S. – One more benefit of this course is that tuition including the Chromebook and three credits is only $1,200. This course runs from late January until early March. REGISTER HERE. I’ve been going to the ISTE conference almost every year since 2003, which makes me feel a little bit old (perhaps wise) here. I have noticed a change, at least a change in the workshops that I attend at this technology conference – there is little talk about technology. I remember 2003 was the year when tablet computers were the big thing. I don’t mean iPads, I’m talking about Gateway tablets where you could fold the screen of your Windows machine all the way around and write on it with a stylus. I remember when teaching with a “smart” board was the big thing. But I’m not thinking that much about technology this time around. The important thing is – we are getting to the point where we can “Get technology out of the way of learning” as Marcie Hull of the Science Leadership Academy put it. 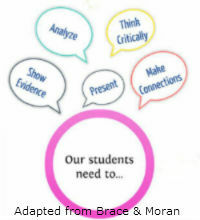 The ideas that I have found worth sharing at ISTE recently center around student centered teaching that get to Marcie’s point. Creativity & Common Core – YES! Sometimes the briefest encounters can provide great information. I pushed my way up the crowded stairway at ISTE 2014 today to see some poster sessions that looked promising. I was glad I found Karena Brace and Barbara Moran’s poster “Teachers + Web 2.0 + Common Core= Creative Classrooms. Common Core and creativity? Absolutely. Karena and Barbara’s work at Wilkes University proves that there is lots of creativity within the Common Core and that digital tools provide students a way to unleash their creativity. Karena and Barbara have shared their work through a Prezi which outlines the critical thinking and literacy skills that can be taught through a variety of lessons. This presentation is filled with lesson plans, links and resources. In addition to this presentation, Karena and Barbara shared information about two Wilkes University MOOCs (free online classes) are available which cover Web 2.0 and Mobile Apps: Teachers + Web 2.0 Creative Classrooms and Teachers Mobile Apps = Creative Classrooms. Registration for the MOOCs will be available on the Desire2Learn OpenCourses website in August. On my sec ond day at ISTE 2014, I was invited to attend the ISTE Leadership Town Hall. When I got to the ballroom filled with superintendents, principals and other school leaders, I was impressed. First, you still do not run into many administrators at technology conferences – you’ve got to wonder what that says about education in our technologically connected world. But more importantly, I was impressed to see who ISTE had selected to represent forward thinking school leaders. A couple of statements by these leaders stood out to me. One statement was by Derek McCoy, the principal of Spring Lake Middle School in North Carolina. Derek is the current holder of the NASSP Digital Principal Award. When asked about high stakes testing, Derek said that “We are not preparing students for a test, we are preparing them for life. A pretty amazing thing to say when too many schools still live and die by their test scores. Another impressive statement was made by Dallas Dance, Ph.D., superintendent of the Baltimore County Public Schools. Dr. Dance was recently elected to the ISTE Board of Directors. Dr. Dance said that “Education is about people, not about programs.” That statement sounds pretty basic, but not when you consider all of the children in our schools who have been cast aside because they do not fit within the confines of a particular program. It is truly heartening to see that leaders like those chosen to speak a this town hall are being recognized for their vision. We need more of this kind of thinking in education. I decided that I am not looking for Chromebook workshops while I am at ISTE2014. Don’t get me wrong, I am still excited that we are getting Chromebooks for our 3rd & 4th graders, but I do not need a Chromebook specific workshop to use this tool. After all, part of the appeal of Chromebooks is that they are simple to use- If you get Google Drive, you get Chromebooks. It is high time that we move beyond being device specific. First we were all crazy about iPads, now we are all crazy about Chromebooks. It’s not about the hammer, it’s about what you can build. With this philosophy in mind, I am looking for conference sessions that focus on topics such as engaging students in writing, collaborating, global learning, reading-writing and literacy. I have added a bunch of sessions to my planner to learn about what I can do with the Chromebooks we are so lucky to be receiving next year. 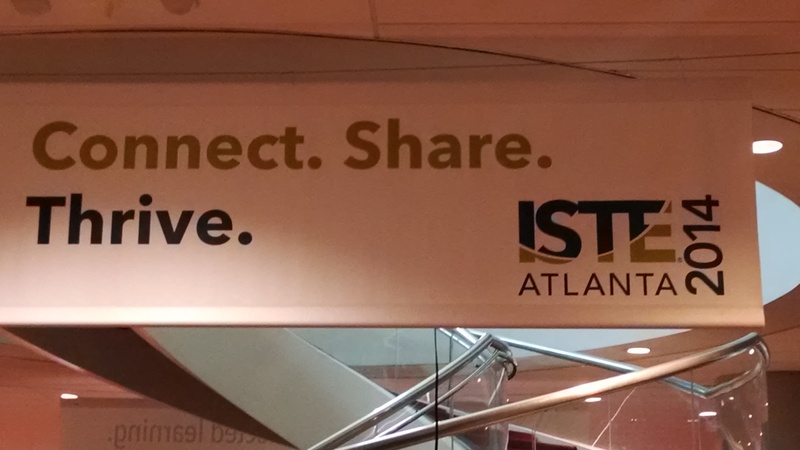 I am writing this post around ten o’clock on the night before the ISTE 2014 Affiliate Meeting in Atlanta, Georgia. I am excited for another ISTE conference to begin! In a way, it is a little bit like New Years for me as a technology evangelist principal. I have two goals in my head for the next school year: Using Google Chromebooks to modify and reinvent learning in my school and using technology to engage my third and fourth grade writers. I will be searching for tips, tools and other information on these topics that I can bring back to my teachers. In a way though, these goals are just like New Years resolutions that I might make on January 1st. Easy to make a goal or resolution but harder to carry it out. Like this conference center that is filled with empty hallways tonight, I pledge to bring my goals to life in the new school year. Just remind me about this post in November and see if I still have this twinkle in my eyes! I am excited to be teaching two online courses for educators this summer. Supervision and Evaluation with the Common Core and 21st Century Teaching in Mind is a course for administrators and anyone who might be supervising teachers. This course will build your understanding of the Common Core and effective teaching with technology through rich discussion and practical projects that you can use in your school next year. Common Core Writing and Technology is a course where participants will gain a thorough understanding of CCSS ELA-Writing standards and will learn practical skills that will allow them to use digital tools to improve their writing instruction. I realize that many teachers and administrators may not have experience with online courses and wonder whether these courses will fit their learning styles or summer plans. I think online classes will suite your needs. You can attend online courses at your own pace within the broad guidelines of the syllabus. Do you work best in the morning or late at night? Do you have more time on one day of the week than another? No problem, my courses allow you to do course work when it best suites you. You will get to know your classmates even though your interactions are online. My courses center around rich discussions of class topics. Not only will I provide frequent feedback, you will have many conversations with your classmates. Vacation plans will not interrupt your participation in my classes. Remember, online classes can adapt to your schedule. If you can carve out a little bit of internet time while you are on vacation, you can participate in class. Even if you are traveling to a remote tropical island, you can make arrangements with me to keep on track with your coursework.